Not many trips can be traced back to the reading of one book, but that is the case with my recent hop down the Aegean coast of Turkey. I’ve always taken a passive interest in the near-history of this part of the world, and upon reading Bruce Clark’s Twice a Stranger – a fine account of the human effects of the Greek-Turkish population exchanges of the 1920s – I couldn’t resist visiting some of the areas described. Whilst one book inspired me to embark on the trip, one was also nearly responsible for making me pack up my bags to return home. I was accompanied most of the way by Robert Byron’s thrilling The Road to Oxiana, in which he describes marauding around the Persia and Afghanistan of the 1930s: wild horse chases across the central Asian steppe, the discovery of little-known ancient architectural treasures, dodging the Persian secret police, dysentry – it all rather put me to shame. Whilst I had nothing to rival these adventures, described below are my own peregrinations around a different, no less fascinating part of the world. I arrived in Ayvalık exhausted after a day-long bus journey from Istanbul, which included an unexpected ferry crossing of a choppy Marmara Sea. The town is situated on the craggy north-western Aegean coast of Turkey, and for hundreds of years it was overwhelmingly home to Greeks, at the time subjects of the Ottoman Empire. After the First World War, the Greek armed forces used this western coast – with Izmir as unofficial capital – as a base to push as far into Asia Minor as possible. The reconquest by Turkish national resistance forces became one of the central, triumphant narratives of the Turkish War of Independence, and after the declaration of the Turkish Republic in 1923 the Greeks of Turkey and the Turks of Greece were swapped wholesale and sent to their ‘natural’ homelands. 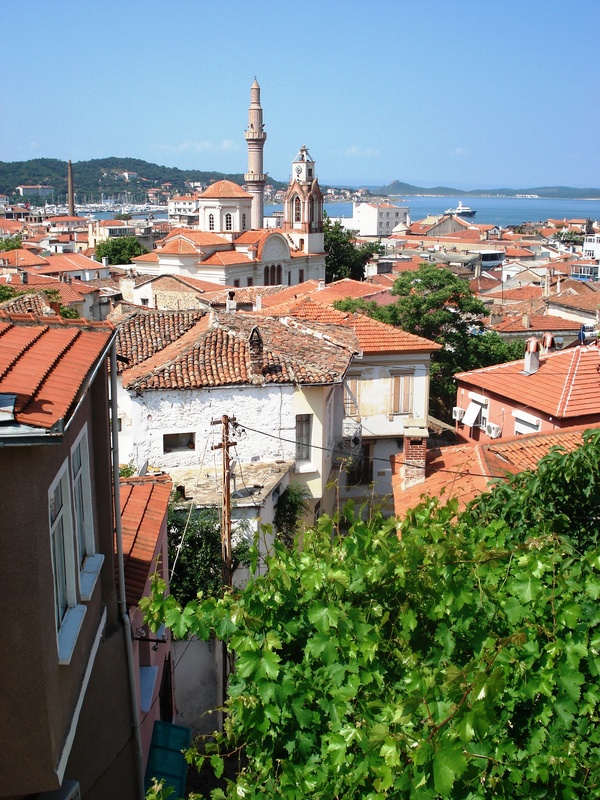 In Ayvalık, the entire Greek population was resettled on the nearby Greek island of Lesvos, and the many Turks of Lesvos went in the opposite direction. I have fond memories of childhood holidays in the small towns of Petra and Mytilene on Lesvos, which were favourite summer spots of my family. Of course, I knew little of this turbulent history at the time; all I really remember is the faint outline of the Anatolian coast high above the horizon on clear days, and the Sunday afternoon military parades on the waterfront, which I now realize carried far more significance than I could have understood then. secrets. Occasionally you come across a house with carved Greek lettering dating back to the 19th century, as often as not practically caving in on itself. Life goes on furtively above your head: muffled sounds behind open windows and closed curtains, from protruding bay windows that lean out and seem to touch each other across the street. The island of Cunda is a siren call audible from the Ayvalık waterfront, and I yielded to it, postponing my onward journey by a day. Cunda has a refined air about it: the harbour is smarter than Ayvalık’s, people give the impression of being even more horizontally relaxed. On arrival I followed the instinct that I always try to satisfy upon landing on a new island: walk back and upwards as high as possible to get an idea of the place from above. 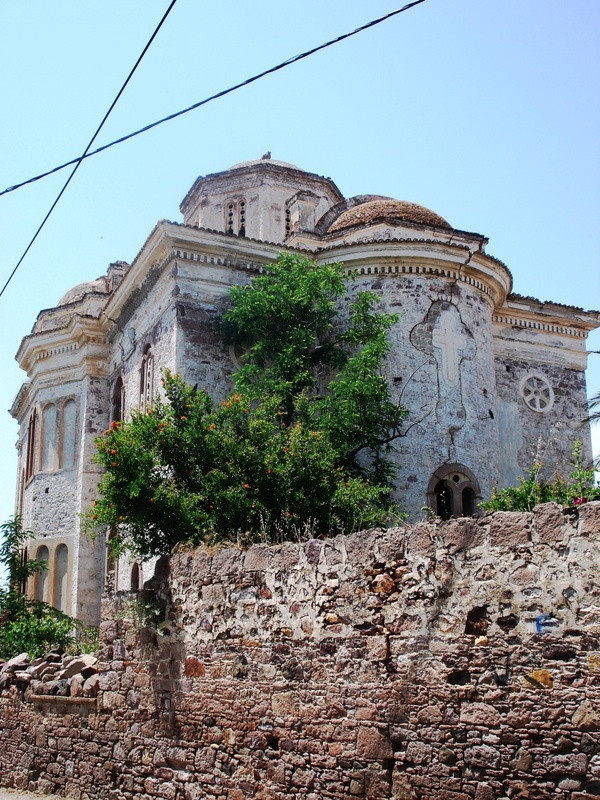 Following the winding old streets, I came across the derelict old Greek cathedral on the hillside, forgotten in a kind of scrubland, unused for almost a century. Disappointingly, (but unsurprisingly), I couldn’t get in as I’d hoped, but I did manage to peer inside through the now-empty windows. It’s been so badly damaged over time – by earthquakes and neglect – that it now looks as though the whole thing is only held up by the wood scaffolding that now fills the interior: to what end one can only guess. Nearby, another old church has almost entirely collapsed into rubble, only a crumbling apse remaining – battered and open to the elements, apparently waiting to be put out of its misery. I left it forgotten and forlorn, and climbed the rest of the short way up to the top, from which, looking west, I could make out the faint outline of Lesvos. One of the paradoxes in this corner of the world is the contrast between its surface picturesqueness and its bloody, conflicted history. The residue of the latter is evident in the thundering nationalism of the politics, a taste of which I got as I was waiting to catch the boat to take me back from Cunda to Ayvalık. It was late afternoon and I was sitting in a café by the harbour, when a loud and apparently stirring recording of the Istiklal Marşı (the Turkish national anthem) struck up entirely unannounced from somewhere nearby. Exactly who was playing it, and why, I’ve no idea, but those around me weren’t splitting any hairs. All conversation immediately stopped; I looked around and within seconds only one person (apart from me) wasn’t standing silently, hand clutching breast, eyes staring grimly into the middle distance. I thought this lone sitter must have been a Greek, but he spotted me from across the restaurant and gestured for me to stand and do the same as everyone else: puzzling as he himself remained sitting. When it had finished everybody sat back down and returned to their tea or games of tavla; I looked back and realised that the only reason the man hadn’t stood was because he was disabled. Cunda is about as secular as you get in Turkey (the two churches here weren’t even converted symbolically – just left to go to seed), the call to prayer from the single, isolated, mosque on the peninsula doesn’t even make it to the harbour. If you measure by the nauseatingly quaint image of old men playing tavla outside backstreet tea houses, or the loquacious women holding court on the steps in front of their houses, the Greeks and Turks on either side of the Aegean are irrefutably similar. The Turks of the Aegean wave the flag as enthusiastically as anywhere, and whilst elsewhere in Turkey these days you can easily forget that the Greeks were once bitter enemies, (there are others to point the finger at now), here the older enmity is still tangible – the narcissism of small differences.